When most people think of software training, they instantly picture a classroom setting. But is classroom training the most effective way to train employees on new enterprise applications like Oracle or Salesforce? 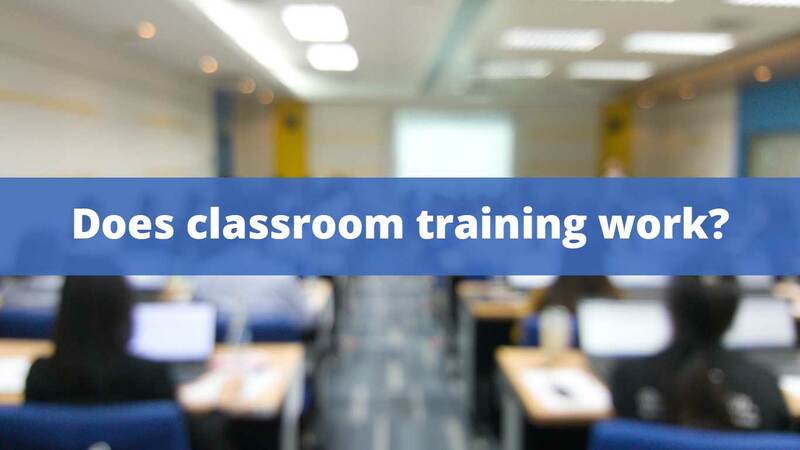 Classroom training can be utilized for sales training or to develop other soft skills, however when it comes to software, classroom training has some serious disadvantages. The major disadvantage to classroom training is the huge disruptions to your business. If an employee is in a classroom training session, they’re unable to do their regular work. For organizations adopting Salesforce, every minute your sales team is in a classroom training session is a minute they’re not out selling. Scheduling classroom training sessions can be burdensome depending on the size and location of your workforce. If your teams work in shifts or across several locations, you’ll have to schedule and pay for multiple training sessions. Also as more companies rely on remote workers, classroom training becomes less feasible. IBM saved $579 million in 2 years by switching 50% of their classroom trainings to a digital format. Oracle’s use of on-demand training saved more than $10 million. Microsoft was able to reduce training from $320 per person to only $17. Classroom training sessions are not effective for mastering a new application because most people struggle to retain the information they learn in classroom settings. According to recent studies, students forget 70 percent of what they learn in a training session within 24 hours. German psychologist Hermann Ebbinghaus dubbed this poor retention phenomenon the Forgetting Curve. Most users will forget everything they learn unless they make an effort to actively review the training materials every day.Unfortunately, most users return to their desks after a training session and immediately get back to work. Before long, most of the information from the training is lost. Product and digital adoption platforms, like letzNav, provide an alternative to ineffective classroom training sessions by providing real-time support and guidance directly in the applications. letzNav’s Guided Workflows will walk users through each task step-by-step. This allows users to learn on the job and enables first day productivity for new users. This hands-on real-world approach is more effective way to train. To see letzNav in action, schedule a demo today.